Making Our Two Cents Worth Your Ten Bucks. Phil and Claire Foster are an average American couple living in the suburbs who want a change from their ordinary day to day. So they decide to head into the city to try the newest trendy restaurant that's opened up. After stealing someone else's reservation they are mistaken for the Triplehorns by the local mafia, and hilarious hi-jinks ensue. Let's get this straight right at the beginning here. 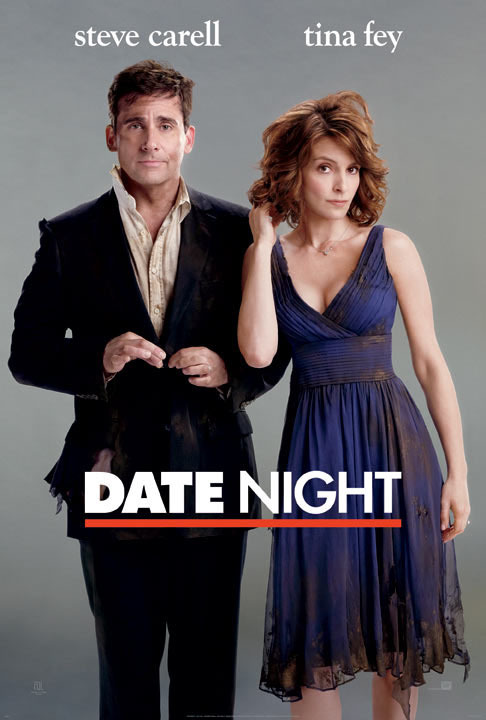 The only reason Date Night would interest anyone is because of Steve Carrell and Tina Fey. They are both on two of the funniest shows on television and have proved themselves to be comedic geniuses. And for the most part, Date Night works because of it. However, had this been any other celebrity pairing, the humor would have fallen flat and I would not have laughed nearly as much as I did. The plot is fairly by the numbers and without the impeccable improv skills of both the leads the jokes are so-so. Where the film really shines is when Steve and Tina get to be Steve and Tina. Lucky for us, that's a good chunk of the film. You can definitely tell they had fun working together and I would definitely like to see them collaborate again in the future. Perhaps on something Tina writes herself. The film has a handful of action sequences and they both handle them well for the most part. Carrell has past experience with Get Smart, but Fey does not seem to really fit in the situations. Filling out the rest of the film are a bunch of pretty hilarious cameos by the likes of James Franco, Mark Wahlberg, Mila Kunis and a hilarious out of nowhere appearance by Ray Liotta as the mob boss after the tripplehorns. When all is said and done Date Night is a fun little comedy that bodes well for future Carrell/Fey pairings and is sure to please fans of both actors.